I refuse to call it a resolution. That innocent little noun gets tougher when you make it into a verb. I am going to take action and clear out stuff if it kills everyone in the house. It's an old rifle/ammo crate someone painted to look like a toy box. I had some old linens stored in it, which made no sense, since the linens took up so little room, and this big box is just, well, big. Next, I'm parting with the WW2 pillow covers - the military ones, which are about half the collection. I am keeping the souvenir ones. 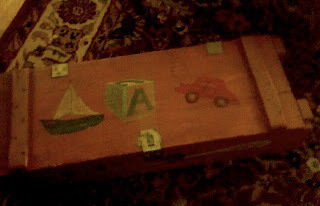 After that, I'm going thru the son nut's old school papers and art projects, and giving that stuff the old heave ho. This is going to be hard, but I'm trying to form a callus on my soft little heart. Then, my closet. I am going to donate that 20 year old ski jumper, and the old purses I don't use, and the shoes I don't wear, even if they're not worn out. I'm going to convince my husband that 4 years worth of Dodger Blue freebie blankets are more than we can ever use, those damn Dodger bobble heads are worthless, and no one collects Eric Karros' stuff. The garage will come next, and by all that is holy, I'm gonna park my car in there.